The ’80s were filled with playthings that were, to quote a famous toy line’s slogan, “more than meets the eye”. And this wasn’t restricted to the obvious contenders, like Transformers‘ robots in disguise or the mutable Robotech mecha or even the hidden-in-plain-sight weaponized vehicles of M.A.S.K., as it seemed like every company fought to bring added playability to their releases through transforming elements. The Real Ghostbusters had “Haunted Humans” which mutated from ordinary people into frightening figures. G.I. Joe introduced Zartan, a master of disguise with removable face mask, and his Swamp Skier vehicle, which deconstructed to resemble a junk pile. Even Masters of the Universe embraced this direction, from the complexity of the Modulok and Multi-Bot figures that were each able to be disassembled and reconstructed in a 1000 different forms (according to the advertising) to the simplicity of Man-E-Faces with its ability to shift between three faces by a simple turn of a dial. And this modular nostalgia has influenced New Zealand born artist Peter Kelk, who has created several two-faced designer toys throughout his career, most recently manifesting in his Fiends of Misfortune pieces. “Remembering back to when I was a kid”, Seymour states, “I always loved the toys that had a double function”. Almost regretfully noting how “art toys are really static and usually stay in glass cabinets”, Seymour has strived to merge these two worlds together, creating art toys that are “playable and collectible at the same time”. First manifesting with his debut resin cast creation, January of 2014’s hand-painted Tri-Kami, its three rotatable sections providing a myriad of exhibitable combinations. Continuing this unspoken invitation to reach into one’s display cabinet and manipulate his sculptural forms, Seymour introduced the two-faced Double Bust in November of 2014, though it was a virtually simultaneously issued Hustlers & Brawlers series that was the final piece of the Fiends of Misfortune equation. Having debuted at the Unamerican Activities exhibition, Hustlers & Brawlers was “a solid resin edition of ten, all with different hand sculpted heads”, Seymour explains, each conceived with “a smooth clean body and a really textured, detailed head, arms, and legs”, an extension of the artist’s discovered love of “works with both a smooth and textured finish as it allows for so many paint applications”. 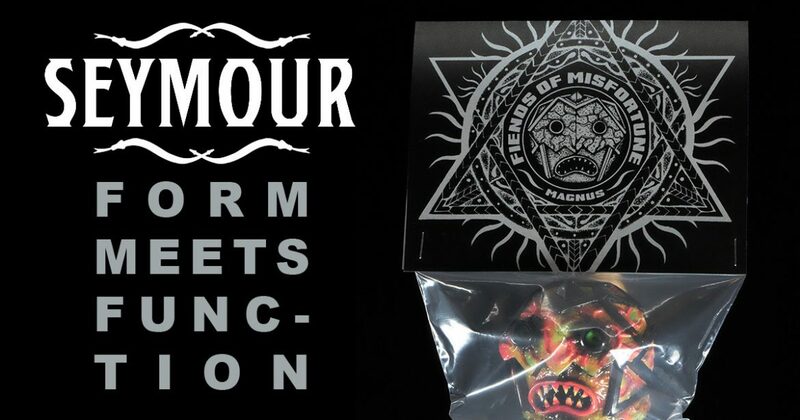 And it was these Hustlers & Brawlers pieces’ profile that Seymour ultimately revisited and added two-sided heads to, thereby creating an evolution for production in vinyl, one titled the Fiends of Misfortune series. “It seems like I’ve been working on this art toy forever”, exclaims Seymour regarding his Fiends of Misfortune Series. Having begun working on them in mid-2016, the artist’s sculpted a single body and three interchangeable, two-faced head variations, which were sent to Japan for production in vinyl. “This part took longer than I expected”, he continues, “and I got a little impatient and started to sculpt more bodies for them”, which were unfortunately destroyed in a studio fire. After nearly two years of waiting for his factory-produced forms from Japan, Seymour “decided to move production to Hong Kong”, he admits. “At the end of the day, I just wanted the art toy in hand and I’ve never been too fussed about where they were created”, the artist explains, “as long as the quality was good and the pieces were slush cast“, a process in which the vinyl is poured into the mold and allowed to cool slightly, the excess liquid poured out to leave a hollow shell of the sculptural form. Each of the three heads transform the shared Fiends of Misfortune body into a different character, which “are all part of a ‘gang’ of misfortunate, naughty monster-kids”, according to Seymour. “The name of the first head release is ‘Magnus & Oculus'”, he explains, while the forthcoming “second head release is ‘Obu & Skog’, and the third is ‘Hakk a & Le Fantomè’.” Ultimately, the “goal is for this art toy is to be very modular and be fun to collect”, Seymour states, noting how he has “tons of ideas for new heads and additions”. While the varied textures on the 6⅓-inch tall vinyl sculptures grant the artist “the freedom to do clean stencil work as well as washes and rubs”, Seymour discloses that these were also designed with the intention of “‘kitbashing’ bits from other art toys and casting new resin additions”, aspects that have become associated with and expected from Seymour’s unique art pieces. “I plan on trying some modifications on some upcoming one-off releases”, he admits, adding how he “would also love to do some special one-offs were the head itself is a one-off sculpt”, a full-circle return to the Hustlers & Brawlers that inspired these Fiends of Misfortune. Click Here before August 5th, 2018 at 11am AEST to Enter the Lottery for a Chance to Reserve a debut Fiends of Misfortune piece.